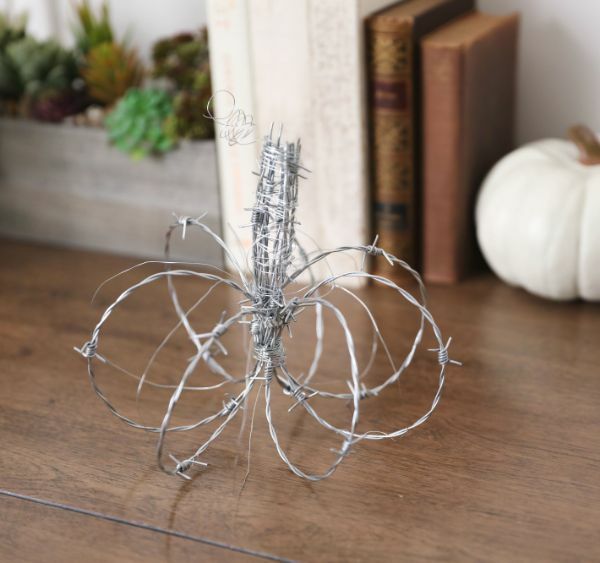 When it comes to creating decor pieces that are as beautiful as they are unexpected, barbed wire is the perfect artistic medium. While many see this jagged wire exclusively as fencing, it has endless possibilities for creative transformation when shaped strategically. This pumpkin craft is a great example. Any project using barbed wire requires protective gloves, wirecutters and pliers to ensure safety. Once these tools are ready to go, creating a barbed-wire pumpkin is a time-efficient and surprisingly simple task. Some well-placed aluminum craft wire and strategic folding yield a barbed-wire pumpkin that makes a rustic accent. 1. 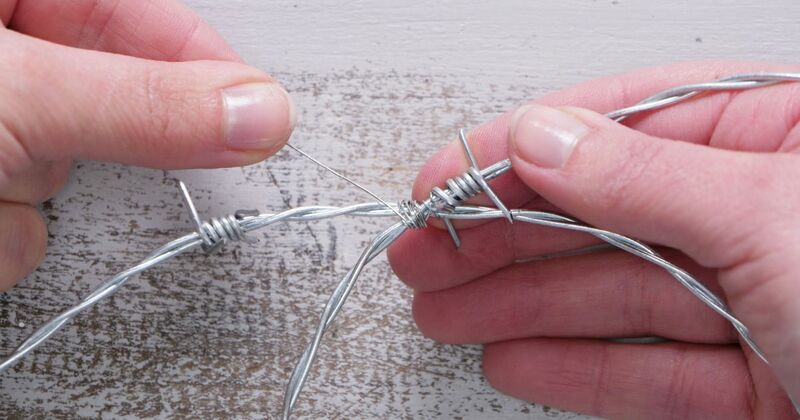 Cut a length of barbed wire to 3 feet and use pliers to slightly round the length in half. Allow 4 inches of barbed-wire ends on either side to overlap. This creates a fish-like shape with a larger circle and two ends pointing out in either direction toward the bottom. Wear protective gloves to prevent scratches and cuts. 2. Cut 6 inches of aluminum crafting wire with pliers and wrap the wire around the center point where the barbed-wire ends intersect. When the wire is secure, cut away one of the barbed-wire ends to create the number “6” out of the barbed wire. 3. Repeat this process with six additional lengths of barbed wire so that there are seven pieces shaped like "6." 4. Stack the seven barbed wire pieces on top of one another, lining up the long ends toward the top and letting the circles sit stacked at the bottom. 5. Cut 8 inches of aluminum crafting wire with pliers and wrap it securely around the entire stack of barbed-wire pieces, connecting the rounded sides of all the circles that begin directly below the long ends that reach upward. 6. Keeping the long ends facing up, pull each barbed-wire circle away from the attachment point and around toward the outer circumference. Arrange so that the spacing between the individual pieces of barbed wire is even, and the shape begins to resemble the body of a pumpkin, with the long ends acting as stems. 7. Cut 6 inches of aluminum crafting wire and wrap it loosely around the top stems of the pumpkin to hold the barbed-wire ends in place. 8. Cut several small pieces of aluminum crafting wire and weave them between the barbed-wire lengths to both keep pieces in place and add texture and dimension to the pumpkin. 9. Place the barbed-wire pumpkin on the ground or a shelf to display.